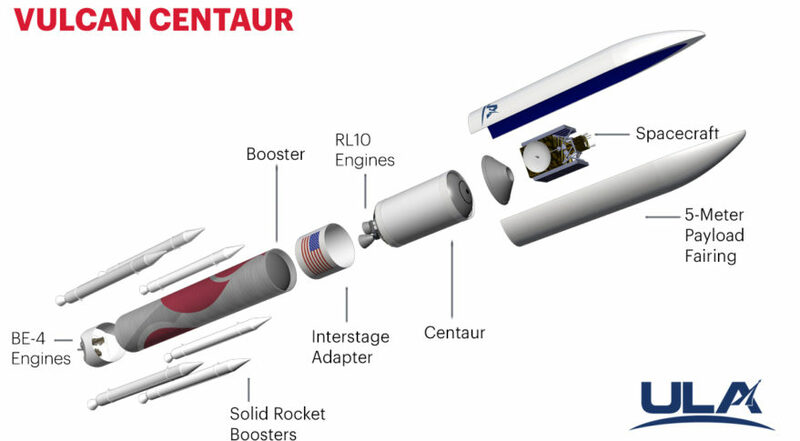 United Launch Alliance's updated diagram of the Vulcan Centaur finally reflects what many saw as a foregone conclusion: the main stage will be powered by Blue Origin's BE-4 engine. AR1 was long considered the underdog, in part because the engine was well behind the BE-4 in development. Vulcan will use two BE-4 engines, each producing 550,000 pounds-force of thrust, in the first stage of the rocket. 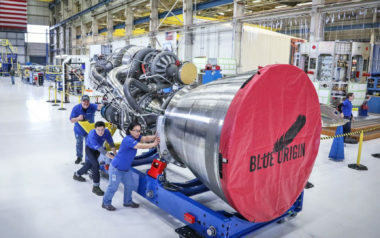 The engine, which uses liquefied natural gas (LNG) and liquid oxygen (LOX) propellants, has been under development by Blue Origin for several years, and started hotfire tests nearly a year ago. The engine had long been the front-runner to be used on Vulcan, even before there was a Vulcan. Four years earlier, Bruno and Blue Origin founder Jeff Bezos held a joint news conference to announce ULA would help support development of the BE-4 as a replacement for the RD-180 used in the first stage of its workhorse Atlas 5 rocket. At the time ULA was still working on designs for the vehicle that ULA unveiled as Vulcan in 2015. In an interview in April 2017, Bruno said he was waiting for Blue Origin to complete a set of tests of the BE-4 before deciding. “The economic factors are largely in place now and the thing that is outstanding is the technical risk,” he said at the time. ULA didn’t explain why it waited until now to select the BE-4. Some industry sources speculated that the announcement was delayed until the companies worked out final terms of the deal for the engines. However, Bruno said in April he already had a firm fixed-price deal for an initial set of engines that Blue Origin planned to produce at its headquarters in Kent, Washington. Later sets of BE-4 engines will be assembled at a new factory Blue Origin plans to construct in Huntsville, Alabama, a site it announced in June 2017 but was pending a final decision on Vulcan. That choice not only allowed Blue Origin to tap into another pool of aerospace talent, but also secure additional political support. ULA couched the selection of BE-4 as one part of a larger industry team that will build the BE-4. Northrop Grumman will provide the solid-fuel boosters, L-3 Avionics the avionics and Ruag the payload fairing for Vulcan. Also a part of that industry team is Aerojet Rocketdyne, who announced an agreement with ULA in May to produce versions of the RL10 engine for the upper stage of Vulcan. Aerojet, though, was also competing to provide Vulcan’s main propulsion with its AR1 engine under development. But AR1 was long considered the underdog, in part because the engine was well behind the BE-4 in development. “I have confidence they can get their engine to work,” Bruno said of Aerojet April, while noting that the engine was as much as two years behind the BE-4. Aerojet also appeared to recognize in recent months that its engine was a long shot. In February, both the company and the U.S. Air Force acknowledged that they were renegotiating the terms of an agreement, formally known as an Other Transaction Authority (OTA), to support development of the AR1. Neither organization, though, would discuss what was changing in the agreement. That renegotiated OTA was completed in June, but was only until Aerojet Rocketdyne filed a quarterly financial report with the Securities and Exchange Commission did it reveal the changes. The original agreement had a total value of $804 million, of which the Air Force contributed two-thirds of the cost, and called for completing development of the AR1 by the end of 2019. That revision also changed the scope of work, with Aerojet now required to only “design, build and assemble” a single prototype engine by the end of 2019. With ULA seeking to perform a first launch of Vulcan in mid-2020, Aerojet was effectively giving up in the race to supply that rocket’s main engine. In a statement to SpaceNews three days before the ULA announcement, Aerojet Rocketdyne spokesman Steve Warren said that the company was still interested in developing the AR1, arguing that the engine could instead be used to power medium-class launch vehicles. 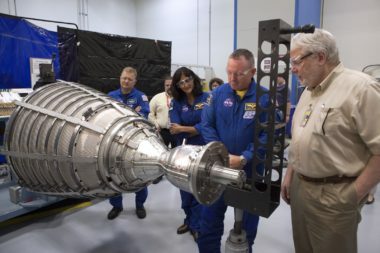 “A single AR1 engine generates 500,000 pounds of thrust, making it ideally suited to power the core stage of medium-lift launch vehicles,” he said. “A medium-class launch vehicle powered by a single AR1 is ideally suited to become a new workhorse rocket for the nation.” He didn’t identify specific vehicles, and it’s unclear any such vehicles are actively being considered given the focus on both large vehicles like Vulcan and much smaller vehicles intended for smallsats. “AR1 is the ideal engine for many possible solutions; it brings the right thrust level, size and performance to a wide variety of launch vehicles,” Warren added. But for Aerojet, that variety of vehicles doesn’t include Vulcan. This article will appear in the Oct. 8 issue of SpaceNews magazine.